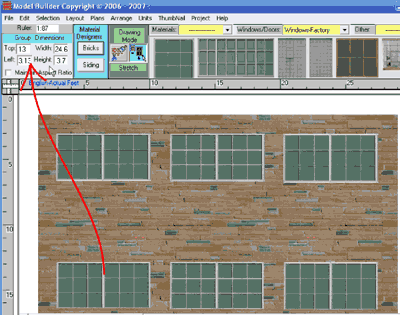 Now, I have my three windows, I need to align and distribute them on wall. Holding down the shift key, I click on each window to select them. You will see blue dashed line around your selcted items. 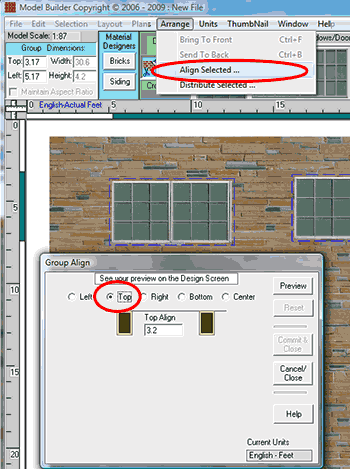 I go to arrange and choose align selected. In this case, I want to align top. I also wanted to distribute my window with respect to the building wall. Leaving my window selected, I shift click to add the wall to my group. I go to arrange and choose distribute selection, preview, commit, and close. Next, we will want to copy these three windows to make the lower storey. I will click on the wall to deselect it. Then use the keyboard shortcut control D. My new group is now selected. 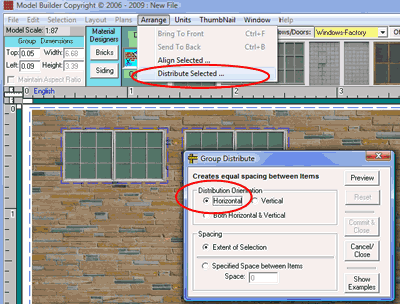 I move my new group of windows lower on the wall. Checking my actual feel ruler, I want these windows to top out 10 feet below the top of the upper storey windows so I locate this group with a top measurement of 13 feet. Now, we are going to scroll down to add a door to the ground floor. 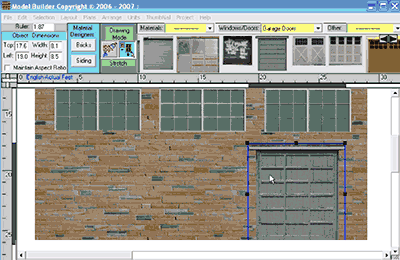 I click on the windows and doors category drop down list and for this project I chose garage door from the list of palettes. I choose the garage door I like and bring it down to the bottom of the wall. 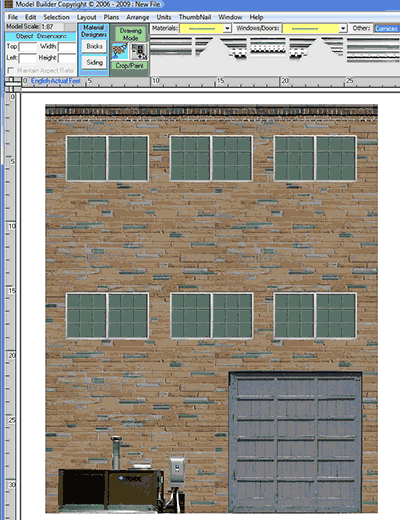 If I need to, I can resize this door, but I like the current dimensions. At this point, I can print the project or add some more details. 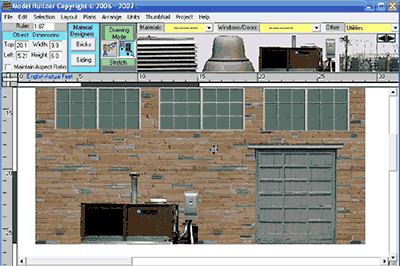 I am going to add a generator next to the door, so I go to the other category drop down list and chose utility. Going over, I find the item I want then bring it into place. Going back up to the top of the building I want to add some trim. I choose the Cornises palate from the other category drop down list and select the Cornise that looks good. I will switch modes to crop off excess material from the cornice. I click on the wall to check my length and my width. I will be using these same measurements for inputing the size of my trim. Now, I have a complete building wall. 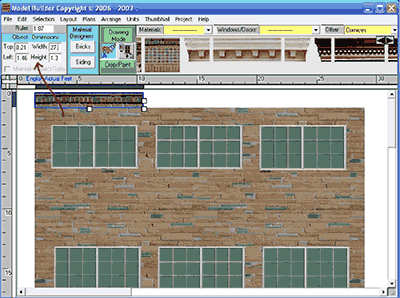 I can save this file then reopen it and make another wall by just changing out the door and adding or deleting a window, adding utilities, or making other modifications.